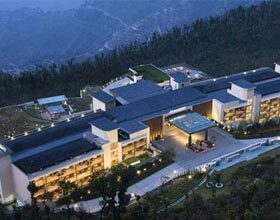 The Claridges Nabha Residence, Mussoorie is an exemplary specimen of bygone era summer retreat dating back to British. The former summer residence of royal Nabha family built in the expanse of 13 acres, this luxury accommodation is nestled amidst cedar and silver oak forests. A flawless fusion of regal amiable hospitality with imperial style architecture makes this a heaven cradled in the queen of hills, Mussoorie. The Claridges Mussoorie, boasts of its mystique ambience in the grandiose verandah which overlooks the lofty Himalayas, surrounded guestrooms. The on-site spa is a treat in the tranquil aura of the mighty Shiwaliks offering reenergizing aromatherapies and traditional ayurvedic treatments. Repose in the vintage styled venue, The Library with comfortable arm chairs beside large windows or heat places. The 22 accommodations of The Claridges, elegantly designed in shades of blue offer splendid vistas from large bay windows. The exquisite chic patterns on the wall are awe-inspiring and the furniture adds a traditional tinge to the guestrooms. King size beds with posteriors, regal styled mirrors, rich upholstery, and modern amenities including the television and high speed internet. These guestrooms and suites are classified into Deluxe Room, Duplex Room, The Claridges Room and The Club Room, based on their exclusive views offered, room size, and wide array of services. 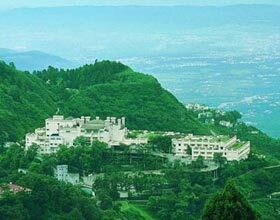 The Claridges Nabha Residence, Mussoorie is a culinary delight for patrons from around the globe visiting this heavenly hill station of Uttarakhand. Alluring vistas of the classical times photographed are displayed on the walls of an all day restaurant, The Pavilion. Savor the scrumptious cuisines from signature Indian, Continental and Chinese fares amidst the revived British era when Mussoorie was a summer retreat for royals and bureaucrats. The Victorian Bar is time machine taking its patrons to imperial era with regal furniture and walled photographs of the former rulers. This lounge bar is realm serving exotic wines and spirits along with finger licking snacks.